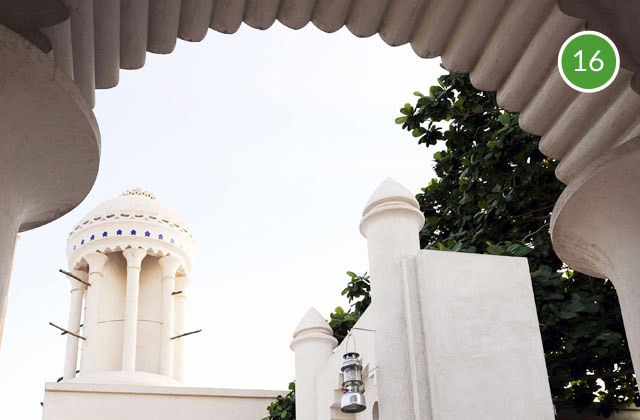 Al Majaz Waterfront houses a range of international restaurants and cafes with exquisite and ideal venue for breakfast, lunch or dinner, or even a business meeting against this picture-perfect backdrop. The park, directly linked to Khalid Lagoon, includes a Jogging Track, Picnic Areas, Day Care Centre (ALWAN), Sculptures and Children's Art Parks, Splash Park, and Mini Golf Course, among others. 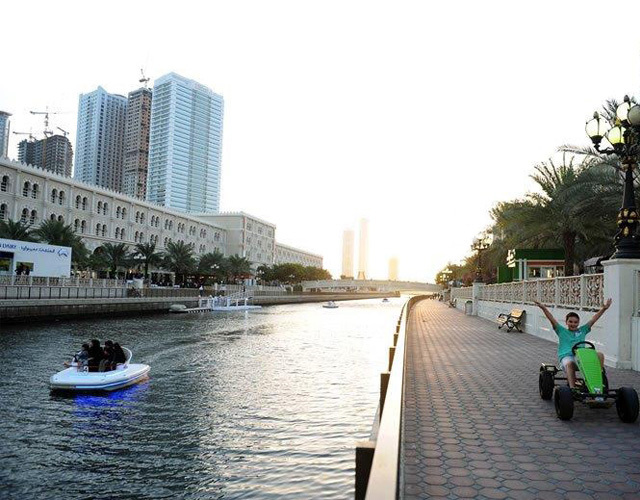 Saturdays - Wednesdays: 6:30 p.m. - 11:00 p.m.
Al Majaz Waterfront restaurants, cafés and attractions have their own timings. 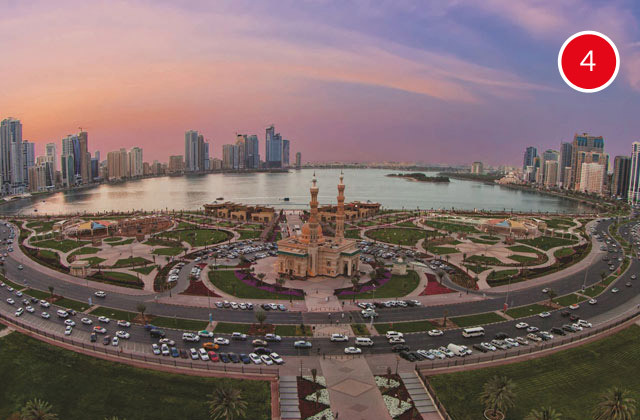 The Heart of Sharjah, a five-phase, 15-year historical restoration project aims to restore and revamp the traditional heritage areas of Sharjah and is scheduled for completion in 2025. It will feature diverse commercial, cultural and residential projects, including a boutique hotel, restaurants, retail shops, art galleries, traditional and contemporary markets, archaeological sites, museums, play areas, and commercial offices. 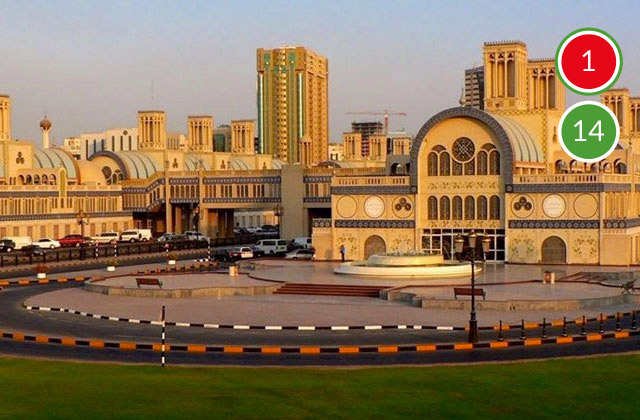 Saturdays - Thursdays: 8:00 a.m. - 8:00 p.m.
Fridays: 4:00 p.m. - 8:00 p.m.
Open since 1979, it is the most famous souq in Sharjah. Discover an extraordinary collection of handicrafts, brilliant in colour and magnetic in appeal. Dive into a maze of more than 600 exciting and intriguing shops and uncover unusual treasures and traditional gift items, handmade goods and regional imports. 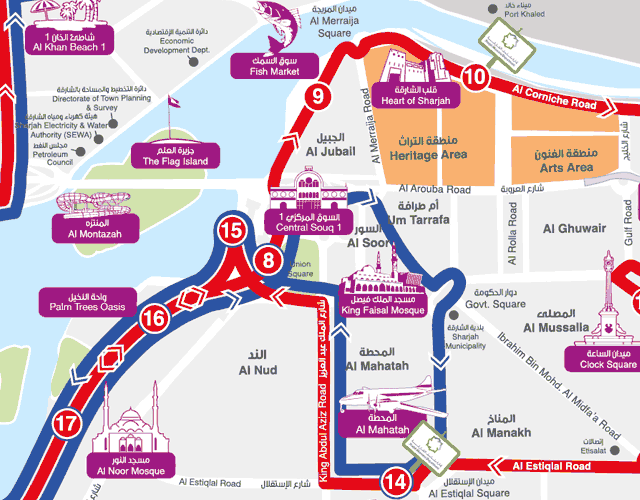 Saturdays - Thursdays: 9:00 a.m. - 1:00 p.m. and 4:00 p.m. - 11:00 p.m.
Fridays: 4:00 p.m. - 11:00 p.m.
Al Qasba is a beautiful destination offering cultural, dining, and entertainment variety. 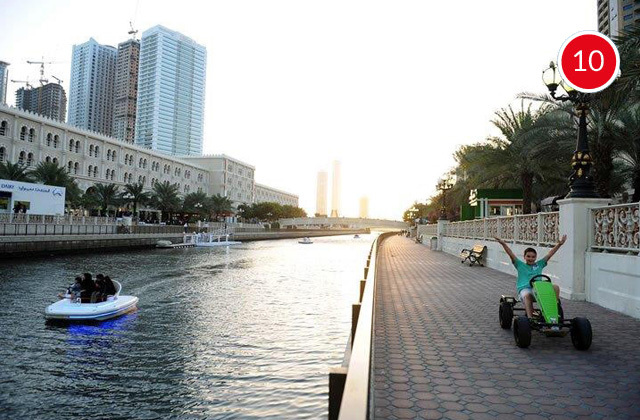 The water canal offers visitors unparalleled entertainment option. 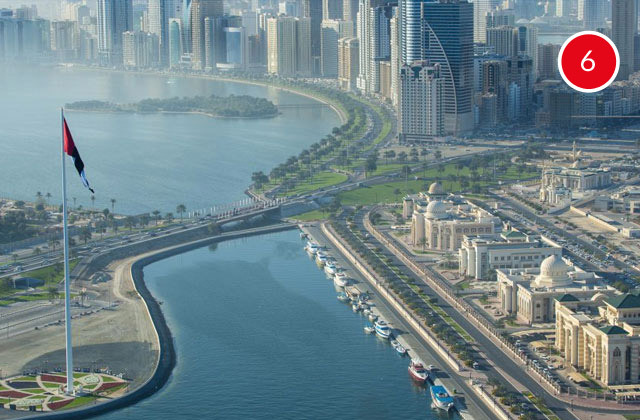 Enjoy the panoramic views of Sharjah and neighbouring areas from the Etisalat Eye of the Emirates Wheel, in the air-conditioned cabins that climb to over 60 metres high. Saturdays - Wednesdays: 10:00 p.m. - 12:00 a.m.
Thursdays: 10:00 p.m. - 1:00 a.m.
Fridays: 3:00 p.m. - 1:00 a.m.
Saturdays - Wednesdays: 4:00 p.m. - 12:00 a.m.
Thursdays: 3:00 p.m. - 1:00 a.m.
Saturdays - Wednesdays: 5:00 p.m. - 11:30 p.m.
Thursdays - Fridays: 5:00 p.m. - 12:30 a.m.
*Timing schedule subject to change according to prayer time. Al Qasba restaurants and cafés have their own timings. 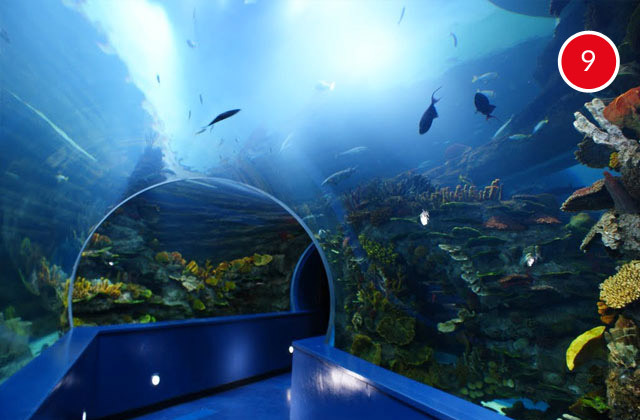 Offering the opportunity for visitors to experience and learn about the marine environment of the U.A.E. through its displays of a wide variety of local fish species. 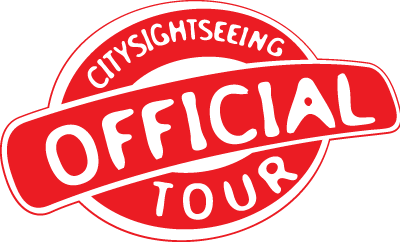 Advanced technologies and cutting edge design allow visitors to wander happily through tunnels and over bridges to gain various perspectives on the 250 species, some rare, some just colorful, living in this beautifully constructed habitat. Fridays: 4:00 p.m. - 10:00 p.m. 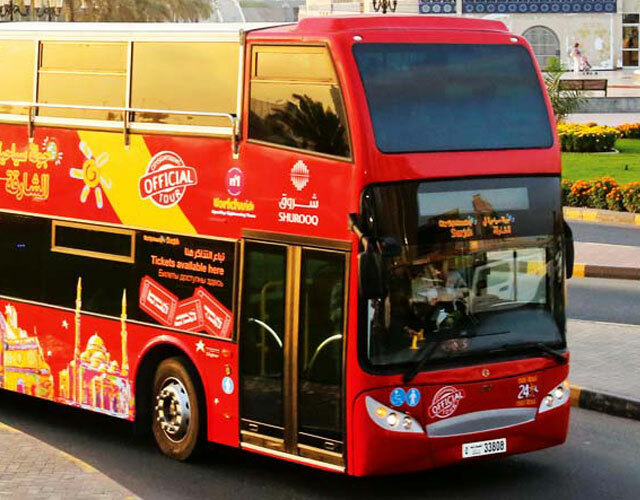 The first of its kind in the U.A.E. 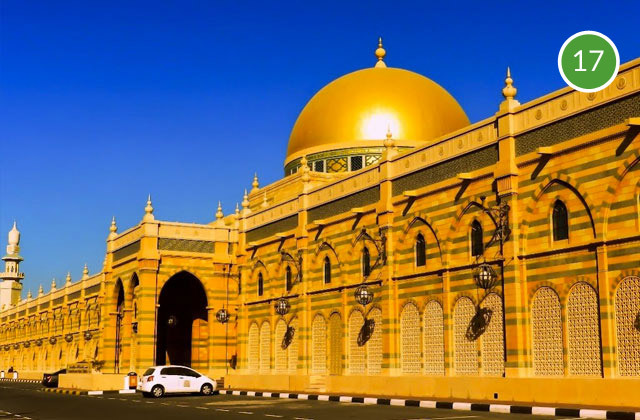 Situated right at the historical Heart of Sharjah, this fascinating museum started its life as a traditional Middle Eastern souk or indoor market. 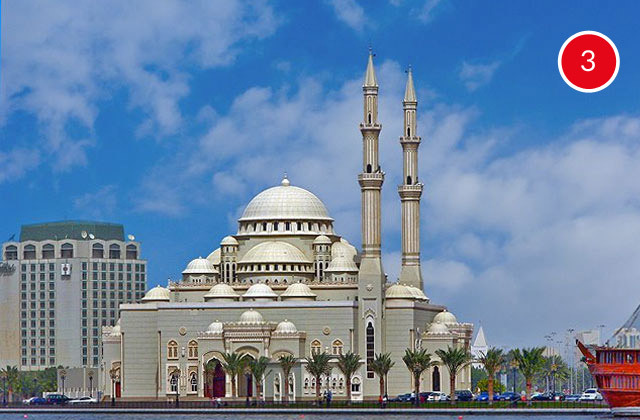 The building now houses more than 5,000 exquisite artifacts from all over the Islamic world, and hosts regular exhibitions and internationally renowned displays of Islamic masterpieces. A national milestone, the 123 metre-high flagpole on the Flag Island is the 7th highest pole in the world. 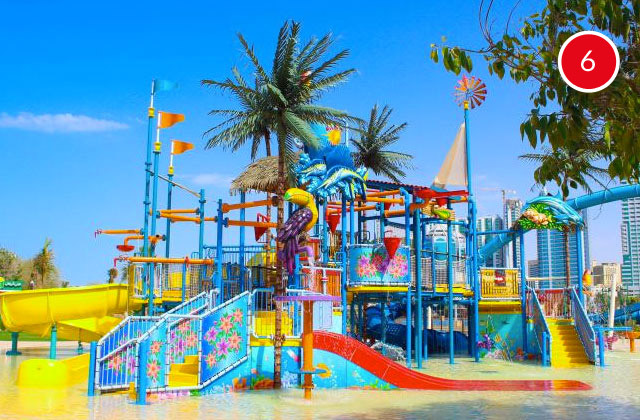 Al Montazah is the first-ever family entertainment destination, with the first of its kind water park among a host of other amusement and recreational attractions. Saturdays - Wednesdays: 10:00 a.m. - 8:00 p.m.
Thursdays - Fridays: 10:00 a.m. - 10:00 p.m.
Tuesdays (Ladies Day): 3:00 p.m. - 12:00 a.m.
Sundays - Wednesdays: 3:00 p.m. - 11:00 p.m.
Thursdays - Fridays: 3:00 p.m. - 12:00 a.m.
Saturdays: 10:00 a.m. - 11:00 p.m.
Al Noor Mosque is the first mosque in Sharjah to open its doors to the non Muslim community and visitors to Sharjah so that they can learn about Islam and the United Arab Emirates culture. 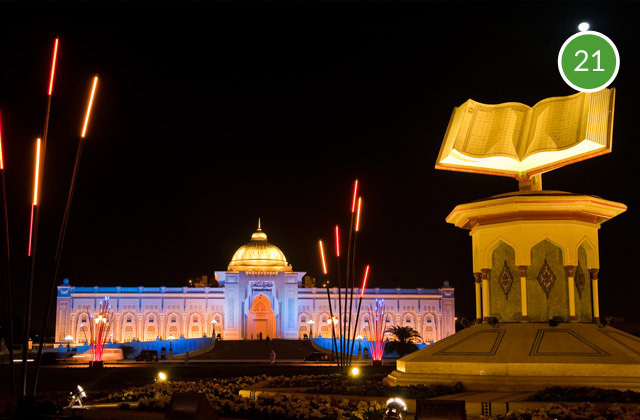 Cultural Square, also known as Quran Roundabout, includes a sculpture of an open Quran built at a height of 7 meters and has been engraved with verses from Quran. 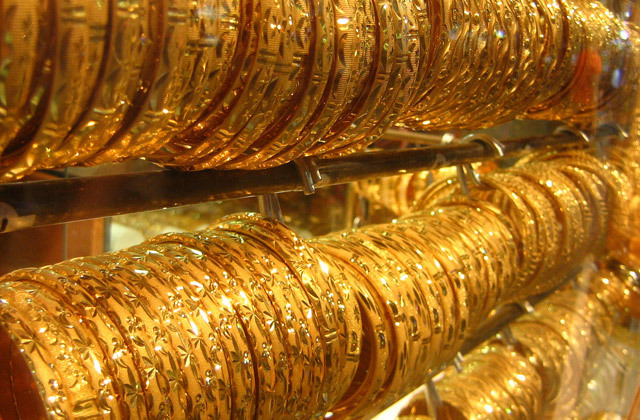 A home for some of the best gold and jewelry makers in the UAE and considered as a destination to latest jewelry seekers. Saturdays – Thursdays: 9:30 a.m. – 1:00 p.m. & 4:30 p.m. – 10:30 p.m.
Fridays: 4:30 p.m. – 10:30 p.m. 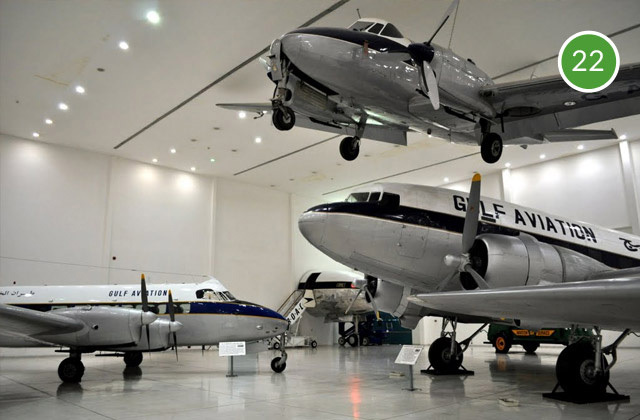 Explore the evolution of aviation in this region at the museum which is located in Sharjah's first airport building.